In 2014, Amazon quietly released the Echo, a 9-inch tall cylinder speaker controlled by a cloud-based voice assistant that goes by the name Alexa. Following the Amazon Echo’s popularity, Alphabet released the Google Home in late 2015. At the end of December 2017, Apple will also be joining the fray with the Siri-powered HomePod. In this article, you’ll learn the differences between all three voice-activated speakers: Amazon Echo, Google Home, and Apple HomePod. The Amazon Echo is one of five products that make up the top-selling lineup of Alexa-powered home devices. This list now includes The Amazon Echo Look Gives You Fashion Advice The Amazon Echo Look Gives You Fashion Advice The Amazon Echo Look is a hands-free camera designed to dole out fashion advice to those who need it. Useful? Possibly. Niche? Probably. Narcissistic? Definitely. Read More the Amazon Tap, Amazon Dot, Amazon Echo Look, and Amazon Echo Show. 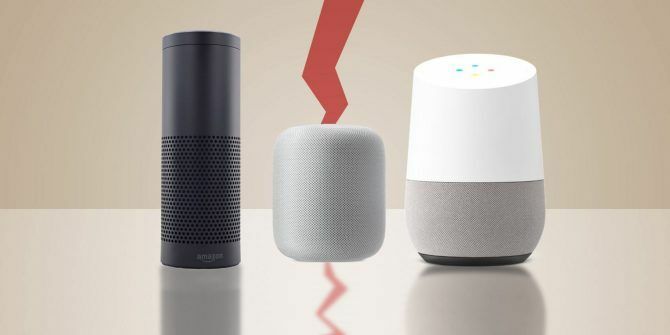 We’re mentioning these speakers only to illustrate the challenges Google Home and Apple HomePod face in the marketplace. These speakers aren’t just competing against one device, but rather five, each available at different price points. Despite this, from here on, we’ll limit our discussion to the Amazon Echo, as it relates to the other two speakers. The Echo features seven microphone sensors embedded under a LED ring at the top of the device. These sensors use what Amazon calls “beam-forming technology,” allowing it to hear from any direction. As a long-time Echo user, I can confirm that it’s a wonderful listener even when there is background noise. It reacts to everything 7 Creative Uses for Amazon Echo and Alexa 7 Creative Uses for Amazon Echo and Alexa You’ve seen the ads starring Alec Baldwin, but you're still not sure what Amazon Echo does or whether you need one in your home. We’re about to find out. Read More , as long as the questions and comments begin with “Alexa,” which is the device’s default wake word. You can also call the Echo “Amazon,” by changing a setting in the Alexa app. Although voice largely controls the Echo, the device also contains three input controls on the top. The first of these is the LED ring, which you can turn left and right to change the speaker volume. There’s also an action button and mute button. The former provides a way to disable a timer or alarm. The latter turns Alexa’s ability to listen on and off. Inside, the Echo includes a 2-inch tweeter and 2.5-inch woofer. This combination makes for a pleasant sound quality. The Amazon Echo is currently available in black and white. If you want a speaker that blends into the background, I’d suggest the black model. If you’re feeling like a rebel, go with the white. Alexa, like Google Assistant, processes data in the cloud. Without an internet connection, the Echo becomes a very dumb device. But, when it has an internet connection, Alexa can do a lot. With Alexa Voice Service, you can ask Alexa to play music, provide information, and update you on news, sports scores, weather, and more. To get started, you need to download and install the free Alexa app. From there, you’ll be asked to connect the Echo to your local Wi-Fi network and verify your Amazon account. Echo provides hands-free voice control for many of the most popular music streaming services, including Amazon Music, Prime Music, Spotify, Pandora, iHeartRadio, and TuneIn. Because Echo also works as a Bluetooth speaker, you can also stream from other services like iTunes from your phone or tablet. Having a speaker to listen to music is one of the main reasons for buying an Echo. However, thanks to Alexa, Echo is much more than a reasonably-priced home speaker. Alexa Skills 18 Awesome New Amazon Alexa Skills You Need to Try 18 Awesome New Amazon Alexa Skills You Need to Try The Amazon Echo's list of skills is growing all the time. Let's take a look at the most useful and silliest skills from the past few months. Read More are apps that work with Amazon hardware to give you a more personalized experience. To date, there are over 3,000 Alexa Skills and counting, courtesy of the Alexa Skills Kit (ASK), which allows third-parties to create these skill sets. Alexa doesn’t have these skills automatically. Instead, you must install them from the Alexa app. For example, you can ask Alexa to order a Domino’s pizza or request an Uber. When you’re bored, challenge Alexa to a game of Jeopardy! When you’re looking for a fancy meal to prepare, ask Alexa to read back the Food Network recipe on the TV right now. One important aspect of Alexa Skills is the Smart Home Skill API. With this tool, manufacturers can have Alexa communicate with their smart appliances. As a result, you can talk to control lights, door locks, thermostats, fans, and more. The biggest players in the smart home industry have products that interact with Alexa, including Philips Hue, Ecobee, and Samsung SmartThings. Amazon is so serious about the Alexa Skills program that it’s begun courting would-be hardware partners with its $100 million Alexa Fund. With this fund, venture capital funding is being provided to fuel voice technology innovation. In other words, you should expect the number of Alexa Skills to continue to rise in the coming years. Amazon provides a few extras for Echo users who are also Prime subscribers. You can enjoy hands-free shopping with Alexa on millions of items on Amazon as an exclusive benefit of your Prime membership. You can also listen to unlimited Prime Music, which also includes original audio series and playlists handcrafted for every interest. Google Home was first teased in May 2016 at Google I/O. Five months later, it was officially demoed, with a public launch date that November. Google Home isn’t going to win any design awards thanks to its funny exterior that looks like a two-toned air freshener. At the top, you’ll find two far-field microphones alongside four LED lights. This location also serves as a touch surface, where you can play or pause music, change the volume, or mute the system. The base of the device is covered in gray fabric, although you can change this using one of the extra bases Google offers. These come in both fabric and metal varieties. Inside, Google Home features an integrated “high-excursion” speaker that delivers “crystal-clear highs and rich bass.” You can pair multiple Google Home devices Google Home Review Google Home Review Google Home is a personal assistant smart speaker, and comes from a company that literally knows everything. The $130 Google device answers questions, controls your smart home, and plays music. Should you buy one? Read More to enjoy the same song in every room of your home. This feature is a big deal. Alexa speakers don’t communicate very well with one another. Plus, you can’t use two or more Amazon Echos to play stereo sound. Google Home’s killer feature is Google Assistant. Like Alexa, Google Assistant uses a cloud to answer your questions. Unlike Alexa, Google Assistant uses natural language processing, which improves reliability. As a bonus, the appliance can also access your Google account for information about your daily schedule, assuming that you use Google Calendar. Google Home is compatible with a handful of music services including Google Music, YouTube Music, iHeartRadio, Spotify, Pandora, and TuneIn. Note that you need a YouTube Red subscription to listen to Google Music or YouTube Music on the device. Google Home also has a smart home component similar to what you’ll find on the Echo. Google Home works with Philips Hue, Samsung SmartThings, TP-Link, IFTTT, and more. There’s also compatibility with other Alphabet products, including Google Chromecast Hack Your Chromecast Experience With These Tricks Hack Your Chromecast Experience With These Tricks Did you know your Chromecast is capable of much more than simply streaming video? In this article we'll show you eight clever hacks which will make your Chromecast experience even better. Read More and Nest. Chromecast integration allows Google Home to act as an audio receiver. For example, you can throw a song from your smartphone to a better speaker in your home, simply by tapping the Cast logo within a supported app. 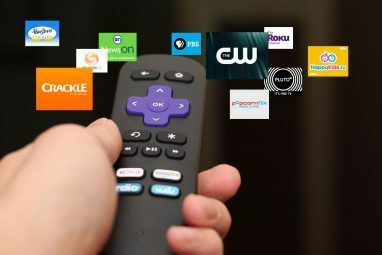 This process works on any Chromecast-connected device, including televisions. A specialized Google developer kit helps would-be companies to integrate their products with both Google Assistant and Google Home. The Actions Kit comes in two flavors: direct and conversational. Direct Actions are for straightforward tasks, such as turning on a light in the bedroom or playing a song from YouTube. More complicated Conversational Actions require some back and forth between you and Google Assistant. For example, you might want to set your Nest Thermostat to an absolute temperature for X number of minutes. First introduced at the Worldwide Developers Conference WWDC '17: HomePod, iOS 11 & Apple's Other Top Announcements WWDC '17: HomePod, iOS 11 & Apple's Other Top Announcements Overwhelmed by WWDC? You don't need to be. Here are all the important announcements from Apple's 2017 keynote. Read More (WWDC) in June 2017, Apple HomePod is expected to offer features a lot like those found on both Amazon Echo and Google Home. However, there’s one area where Apple appears to have gone in a different direction: sound. Apple HomePod comes equipped with some pretty impressive internals that will allow it to offer 360-degree sound. Under the hood, you’ll find a high-excursion woofer with custom amplifier, seven tweeters, six microphones, and more. Better still, the device is equipped to analyze a room’s acoustics to adjust the sound based on its location. In doing so, the device directs the music in an optimal direction. Want more than one HomePod? Thanks to AirPlay 2, you can add HomePod devices to multiple rooms. And these speakers can communicate with one another so that you can play your music all around the house. With Apple’s Siri, you’ll be able to control the music on HomePod with your voice. The same goes for HomePod’s integration with Apple HomeKit. This protocol allows software developers to make applications that work with home automation products. In other words, HomePod, like the Amazon Echo and Google Home, will allow you to control home appliances. Not surprisingly, Apple Music 6 Reasons to Listen to Beats 1 on Apple Music 6 Reasons to Listen to Beats 1 on Apple Music If you haven't yet listened to Beats 1, we're here to tell you why you should. In this article, we'll explore six reasons why Beats 1 is worth your time and attention. Read More and Siri both play a big part in what makes HomePod tick. With Apple Music integration as one of the HomePod’s best features 12 Apple HomePod Features That Will Make You Want One 12 Apple HomePod Features That Will Make You Want One Don't have a HomePod yet? We round up the coolest Apple HomePod features that will make you want to pick up the smart speaker. Read More , users will have access to over 40 million songs from over 2 million artists. Because of AirPlay 2, you’ll almost certainly be able to listen to other music streaming services on HomePod. However, Siri will only work with Apple Music, at least at the beginning. What about Bluetooth? Apple hasn’t said whether HomePod has support for this protocol, which would open up even more music streaming services for use on the speaker. There’s still a lot about HomePod that’s unknown. However, it’s already clear that Apple plans on positioning the device as a high-end speaker system for the home. This decision makes a lot of sense given the device’s premium pricing. When it’s released, Apple HomePod will be available for $349. The smart speaker market continues to evolve and will continue to do so in the months and years ahead. At the time of this writing, Amazon Echo offers more features than Google Home, although that’s beginning to change thanks to Google Assistant. HomePod’s release will have a profound effect on the smart speaker market. The increased competition will almost certainly lead to even better products from all those involved, which is a win-win for consumers. If you’re in the market for a smart speaker right now, the Amazon Echo continues to be the product to beat. There’s no way of knowing where the market will be in just a few months time. Stay tuned. And if you’d like a smaller speaker, check out our comparison of the Google Home Mini and Amazon Echo Dot Google Home Mini vs. Amazon Echo Dot: The Best Small Smart Speaker Google Home Mini vs. Amazon Echo Dot: The Best Small Smart Speaker Struggling to choose between the Google Home Mini and Amazon Echo Dot? Find out which is the best affordable smart speaker. Read More . Explore more about: Apple HomeKit, Home Automation, . Google Home until Apple comes out with something. I tried Amazon and all I heard was I DONT KNOW so I got Google Home and it is cool. I just returned Google home for the second time, the first time I had a terrible time connecting it to my wi-fi (and before you ask it was not my wi-fi it was definitely the device) it took maybe 20 trys to get it to connect. I was determined. After it finally connected, after about 3 hours of initial use, there was a horrible sound playing through the speakers. Unplugging it didn't work. So i took it back but I like the way it operated so I returned it for another (although the sales associate said he had an echo and loved it) and gave it another shot. Connected first time no problem, played well, but when you would ask a question it couldn't answer simple questions then it started randomly coming on and speaking and playing music without even talking to it. Needless to say it was returned today and I'm going to try Amazon Echo once it gets back in stock. I don't understand the point of doing a review and coming to the summary section, where you suggest that the reader buys one of each to do their own evaluation. First, thanks for reading. Second, this serves as a comparison report on what's available and what's probably coming. With the holidays approaching some people might want to buy a Google Home or Amazon Echo. It's important for them to know, however, that Apple could also be introducing a similar product as early as next spring. The article does not mention that Echo can access Google calendar. Also fyi there is a third que word...."echo" to wake up Echo. That logic is idiotic. Just because America invented the automobile, does that mean that someone can't come out with a better product? Google Home is going to crush echo. The Google ecosystem virtually guarantees that. Once developers hop on, and I would imagine they would quickly once APIs are released. Well said comment. Thanks for reading.